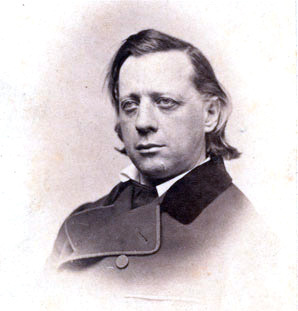 Henry Ward Beecher, the eighth son of the Rev. Lyman Beecher, was born in Litchfield, Connecticut, on 24th June, 1813. The brother of Harriet Beecher Stowe, he was educated at the Lane Theological Seminary before becoming a Presbyterian minister in Lawrenceburg (1837-39) and Indianapolis (1839-47). His pamphlet, Seven Lectures to Young Men, was published in 1844. Beecher moved to Plymouth Church, Brooklyn in 1847. By this time he had developed a national reputation for his oratorical skills, and drew crowds of 2,500 regularly every Sunday. He strongly opposed slavery and favoured temperance and woman's suffrage. Beecher condemned the passing of the Kansas-Nebraska bill from his pulpit and helped to raise funds to supply weapons to those willing to oppose slavery in these territories. These rifles became known as Beecher's Bibles. John Brown and five of his sons, were some of the volunteers who headed for Kansas. He supported the Free Soil Party in 1852 but switched to the Republican Party in 1860. During the Civil War Beecher's church raised and equipped a volunteer regiment. However, after the war, he advocated reconciliation. He gained unfavourable publicity in 1874 when he was put on trial for adultery, but he was acquitted and returned to his church.